NYBG’s community gardening outreach program is commemorating its 30th anniversary with a photo exhibition in Ross Gallery. 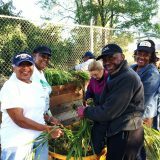 Bronx Green-Up supports more than 200 local greening groups, schools, and community organizations in their missions to improve their neighborhoods through greening projects. In honor of this anniversary, four teen photographers from the Bronx Documentary Center’s Bronx Junior Photo League document the activity of these organizations, from planting, weeding, and composting to harvest and celebration. Their dynamic photographs celebrate the community-building and activism taking place all across our borough. Bronx Green-Up provides horticulture education, training, and technical assistance to Bronx residents, community gardeners, urban farmers, local schools, and community organizations.